ANCORS is Australia’s only multidisciplinary university-based centre dedicated to research, education and training on ocean law, maritime security and natural marine resource management. We also provide authoritative policy development advice and other support services to government agencies in Australia and the wider Indo-Pacific regions, as well as to regional and international organizations and ocean-related industry. In 2014 Quentin and Lucas had made a connection and secured a small Global Challenges grant which would enable Lucas to work with the team as an artist. Lucas very generously offered me the gig, being his PhD student, if Global Challenges would agree to this. They did, on the condition that the trip occurs this year. So we met today to discuss this proposed trip, with me as the artist. Here’s the little I know about Kiribati: it’s an archipelago of islands spread far and wide, with a total population of just over 100,000. The main island, Tarawa, has a large concentration of the population. Its density is equivalent to Manhattan’s! Outer islanders make their way to Tarawa to try and find work. Most of the employment in Kiribati is in government organisations. It’s a very low lying nation, with the highest parts of Tarawa being only three metres above sea level. Some Pidgin is spoken in the ‘city’; I-Kiribati is the official language, with few people speaking fluent English. Soils are very poor – Kiribati is therefore reliant on fishing for food, as well as a few crops such as taro and coconuts. There are some obvious problems for Kiribati and its people. Climate change is contributing to sea level rise, which poses a real threat to the low-lying nation. Sanitation is an ongoing issue – there is very little waste and sewage management and poor water quality. Coastal fishing is under pressure from the growing population. Aurelie and Brooke often work in outlying communities in regard to sustainable fishing. We’re trying to work out whether me going there this year is feasible and how I could use my time in Kiribati – watch this space. Day two of the Olympics and the world records are tumbling. Tearing our eyes away from the action in Rio, we’re seeing an Olympiad of a different kind: Donghong’s marathon experiment in 3-d modelling with robotics. Our visit today revealed the fourth iteration of the experiment in carving a topographic model from plywood. Donghong is now satisfied that he has achieved an acceptable compromise between fine workmanship and efficiency. 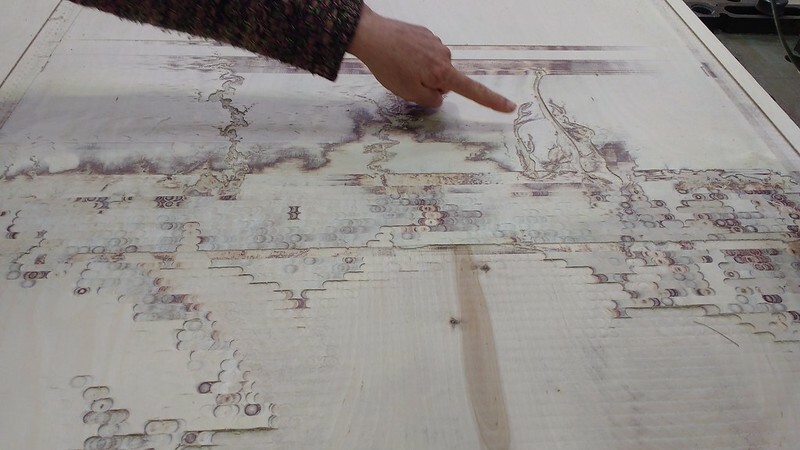 One of the most interesting and confronting aspects to come out of this whole project arose fairly soon after I transferred the elevation data set into Stephen and Donghong’s hands. 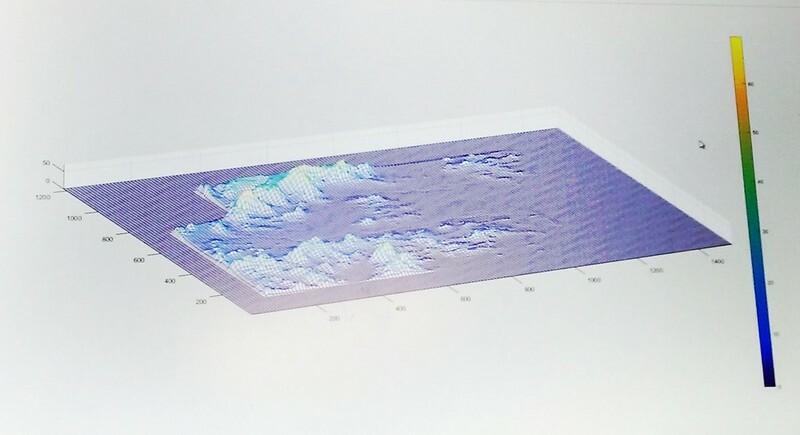 Donghong had transposed the data into a 3-d topographic image on the screen. In this image the landscape of the Mackay catchment looked dramatic, with sharp peaks resembling the mountains in southern China. The reason it looked like this is that he had exaggerated the elevations to make an otherwise dull, seemingly featureless land mass into something more ‘readable’. This was a surprising turn of events for us – we hadn’t anticipated that the ‘true’ topography of the catchment would not convey the visual information we wanted people to see. By increasing the ratio of the elevation relative to the area of land represented, the land forms became more legible. Somehow it seemed deceptive to be doing this. It then raised the question of mapping in general. How accurate are maps? What story are they telling? You only have to think of the difference between the Mercator projection maps and the Peters projection maps to realise that there seems to be no universal standard for mapping. As it turns out, the exaggerated elevations have been decreased to something closer to the actual elevations. This was for practical reasons in the end – less wood will be used and the job therefore completed more quickly. Instead of six sheets of 15mm ply in height, the model will now require only three sheets. 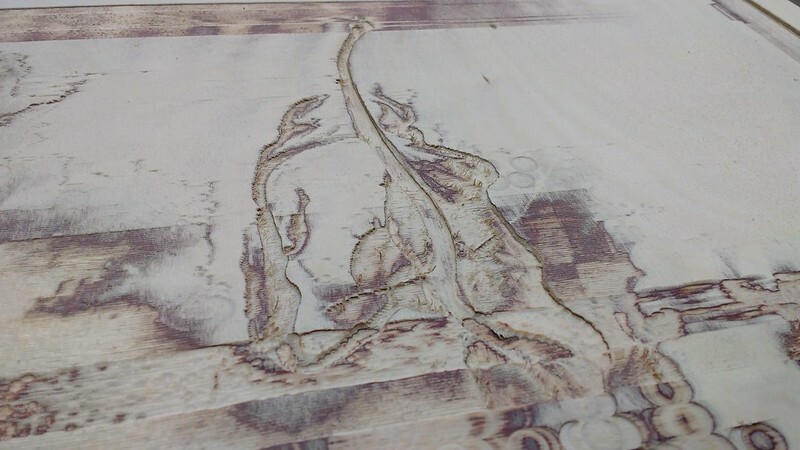 Additionally, Donghong has decided to use the 2mm router bit instead of the 1mm bit for the finer work, as this will also increase productivity. The result won’t be as fine, but is acceptable for our purposes. Over the weekend I made some sandbag weights which will hopefully be useful when it comes to gluing ‘islands’ of land cut from the second sheet of ply on to the base sheet. At this point I’m imagining that it will be like a giant jigsaw puzzle. Tomorrow, all being well, I’ll help Donghong with the gluing. He anticipates finishing the model on Wednesday. Once it’s ready to be put in our hands, we’ll have to seal it will something to prevent moisture from warping the plywood. Kim and Stephen inspect the robot – it is a large orange arm that can hold almost any tool, and move with incredible precision exactly where you tell it to. Today Lucas and I visited a large, high-ceilinged industrial scale workshop at the rear of Building 39. It is the site where our 3d model of the Mackay catchment is being fabricated. Earlier this year we took up a serendipitous opportunity: Zengxi Pan, an Engineering and Robotics fellow, wanted to work with artists for a Global Challenges grant. At that time this we were already planning to build a 3-d model for the Sugar vs the Reef project that Lucas is driving. It was an opportunity too good to resist. 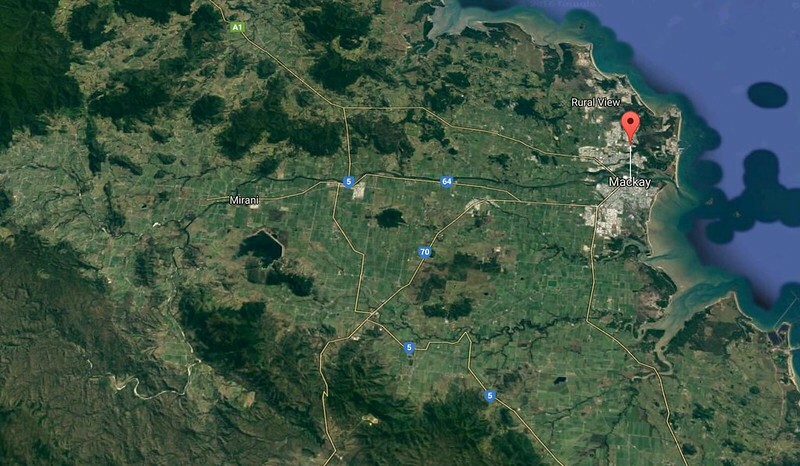 Mackay map showing the general area for which want to make a 3d model. The idea is to physically manifest the landscape on a smaller scale, so farmers and everyone else can get a sense of how the water (with sediment, fertilisers, pesticides etc) flows from land to sea. At our first meeting with Zengxi (Stephen), he confidently predicted that the robots could do everything we wanted them to do and more. It was as if the robots could cancel out human effort entirely, once you gave them the correct commands. We went away from that first meeting amazed and amused that a problem that we had on our list to solve (but which we had no idea how to solve) was effectively being solved for us. 3D digital simulation of the Mackay Pioneer River Catchment area. The data comes from an open source Digital Elevation Model. 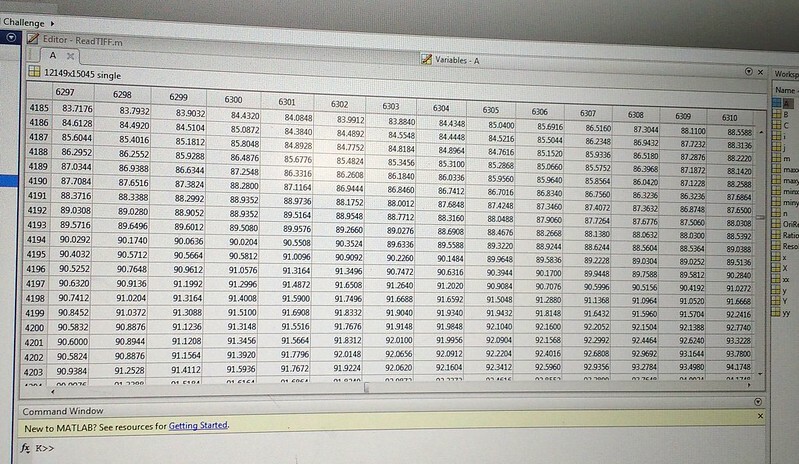 What the data set actually looks like – a boring grid of numbers, each of which refers to a location point on the landscape, and that point’s corresponding elevation above sea level. We have learnt so much in these past couple of months! Since then we have been liaising with Zengxi and his research fellow Donghong Ding, an affable young man who is doing all the hard work. My role as research assistant in this 3d project is to do some of the background work. I’ve sourced the data set that was needed for the model and have done materials research and of course met with Lucas, Stephen and Donghong on a fairly regular basis over the last two or three months. 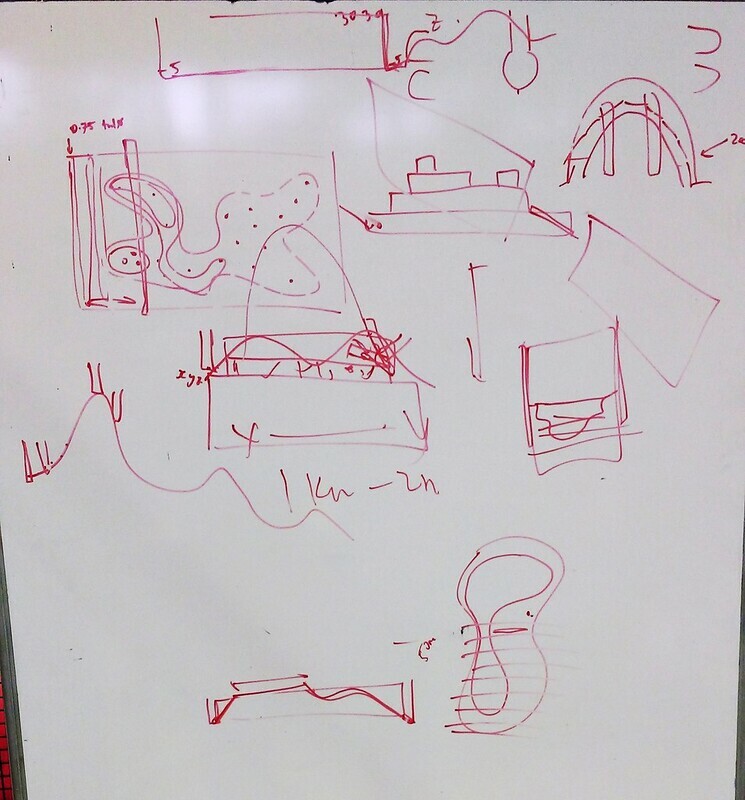 Whiteboard in the Robotics workshop – these are Dong Hong’s sketches where he is trying to work out the most efficient method (in terms of time and materials) for making our 3D model out of plywood using a router. I have now realised that Stephen’s confidence was broadly based. His claims about the ease with which the robot can perform the task of fabricating a 3-d topographic model have a few caveats. In fact it is a highly experimental process and Donghong is immersed in an intensive process of problem-solving. Dong Hong with the big robot arm. In the foreground is his first experiment using a 1mm router bit, moving in tiny increments of 0.1mm for each pass. A small (15cm square) “proof of concept” model which Dong Hong and Stephen made before beginning the bigger version. 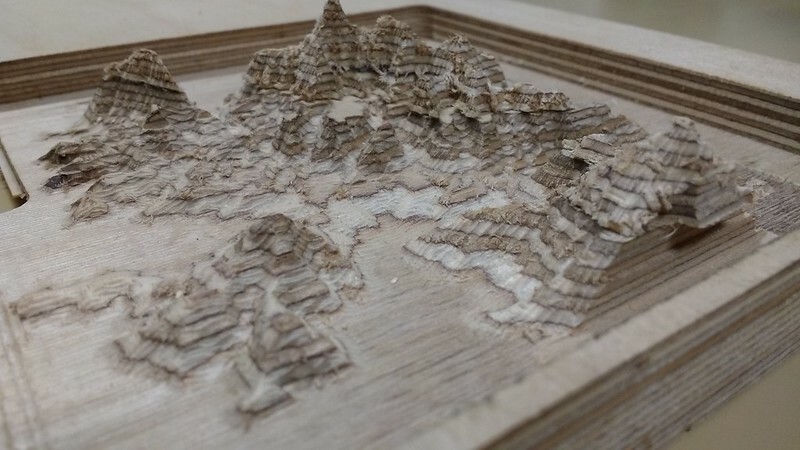 It’s beautiful, and we really like how the layers in the plywood operate visually as elevation contour lines. Donghong is grappling with the best way of configuring the robot to perform this task. He is doing this with industrial output in mind: how to use the least amount of materials and how to perform the task in the most time-efficient way. 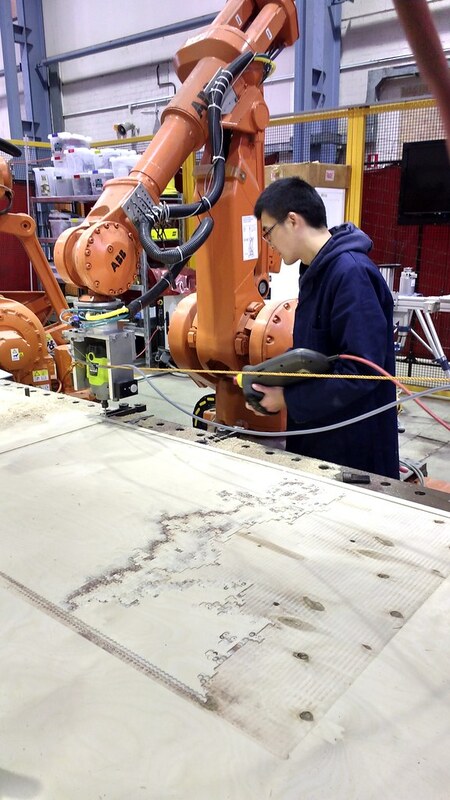 It is an incredibly slow process, as the robot moves the router back and forth across the plywood in tiny increments. 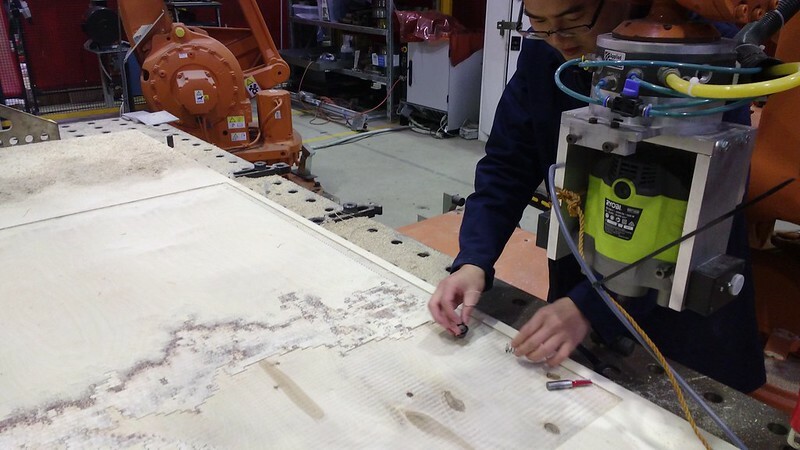 To this point, using the method Donghong devised, the robot is still on the first sheet of plywood. Ultimately the work will require about six thicknesses of plywood sheeting to reach the required elevation. 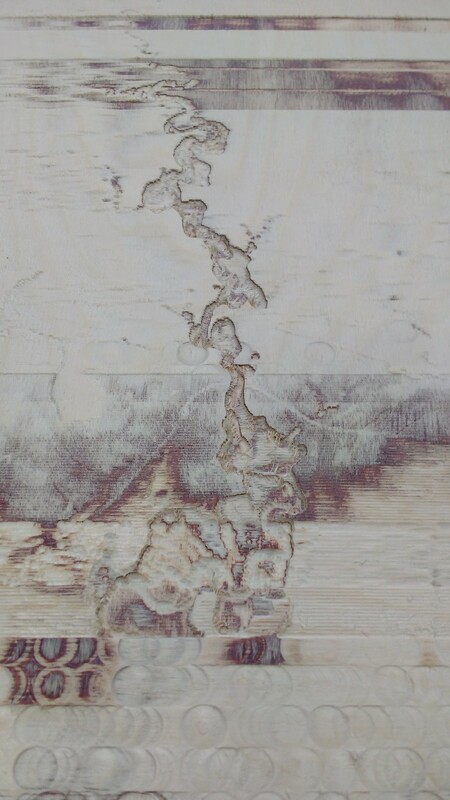 This is just the base layer (several sheets of plywood will stack on top of this one) – but you can already see the beautiful estuarine shapes emerging. Work in progress on first iteration of the 3D model. As the elevation increases, the robot will eventually be cutting out very small shapes which represent slices of landmasses. Donghong then has to match the pieces and glue them together by hand. This strikes me as a very painstaking task, but in Donghong’s view it will be the most efficient and economical method. I am offering him some woodworking expertise when it comes to gluing and clamping. My job now is to make some soft weights, which I’ll probably make with socks and sand or rice. These will act as clamps, laid gently over the complex small shapes while they are being glued to their base layer. Of course it would have been easier to just glue the requisite number of plywood sheets together and carve subtractively from the top down, but this would apparently lead to a 90% wastage of material. Donghong is not happy with the current cutting program, so it’s back to the drawing board – he is devising a new method which should make the job faster, so he will start the process again from the beginning. We asked if we could keep the test piece, as it has yielded fascinating marks and shapes and is a good example of an experiment-in-progress. Donghong was a bit bemused by our request – why would we want to keep a failure? This is worth a look, compliments of Kirsten Bradley (Milkwood). Here’s a video of day two of their pilgrimage in Wales. This blog is for notes in progress on the DECRA research project "Sugar vs the Reef". A project bringing together artists, farmers, and community members to explore the possibilities for cultural and environmental transformation, using the sugar cane industry as a case study. Exhibition at Artspace Mackay June 2018.